Starting at $1 per image. ZoomStream makes Vendio Image Hosting sing. With ZoomStream, you can attach fast loading, zoomable images to your Vendio store, or any website, allowing your products to be presented in the most professional way possible. Detail on demand: Buyers can zoom in on details without waiting for multiple large images to load. Improved bidding and conversion: Professional-looking listings with detailed images builds confidence with buyers. They will buy with confidence. Simple to use: ZoomStream requires no special software. Simply upload a high-resolution image and we'll do the rest. 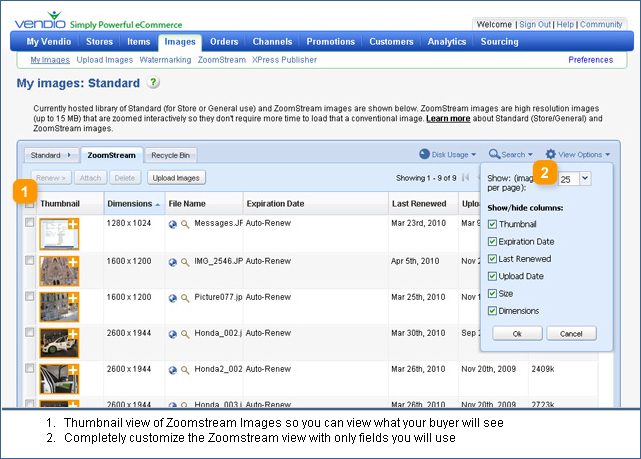 A Vendio Image Hosting subscription is required to use Zoomstream.